To be honest, I’m not that fussed about risottos anymore. I’m more concerned about testing some ‘realities’ with it! 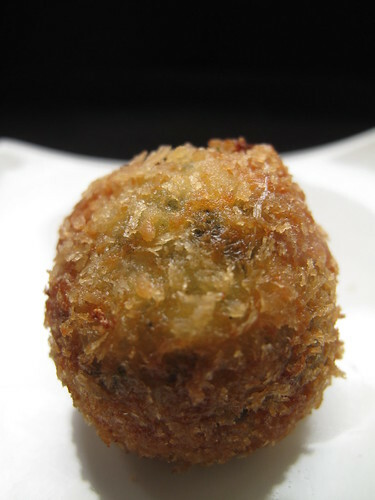 Don’t get me wrong, I like risotto but its Arancini which I’ve been hankering after, especially cause I hadn’t tried it! It wasn’t always like this however. 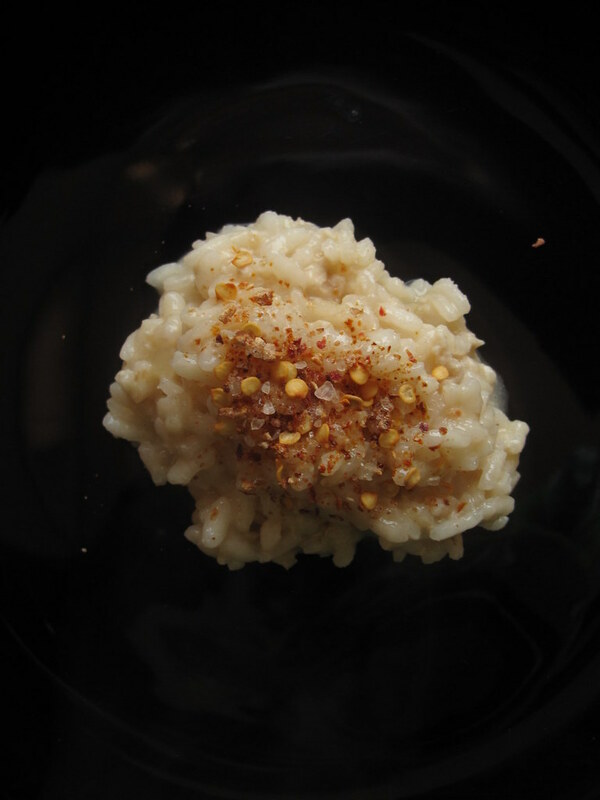 The first time I made risotto, I used a Nigerian-style stock, flavoured with ginger, garlic, curry and thyme. Needless to say, it was a disaster. And that put paid to making anything by that name for a few good years, till I successfully tried a pork and cider version, which was right on the money. The 2010 March Daring Cooks challenge was hosted by Eleanor of MelbournefoodGeek and Jess of Jessthebaker. They chose to challenge Daring Cooks to make risotto. 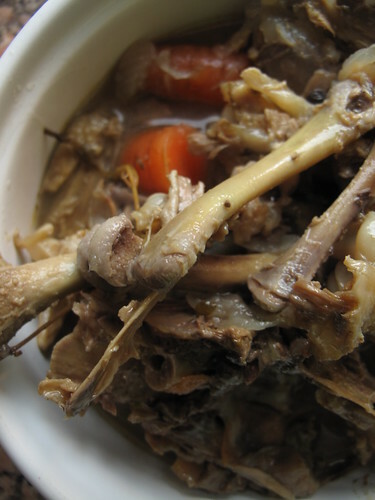 The various components of their challenge recipe are based on input from the Australian Masterchef cookbook and the cookbook ‘Moorish’ by Greg Malouf. Could I make it up to a point and finish it off later? 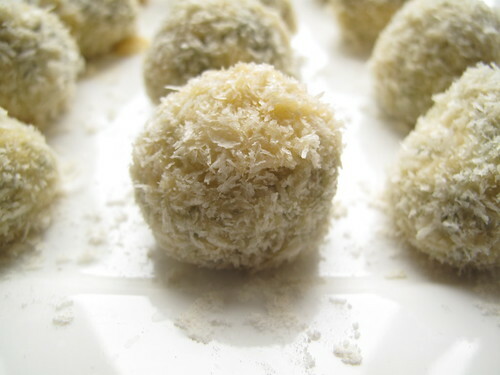 Could I successfully translate the leftover/finished recipe into rice balls? And the answer to both question was a resounding YES! I know people would argue about what a ‘true’ risotto is, and some may not approve but……experimenting is part of my game! 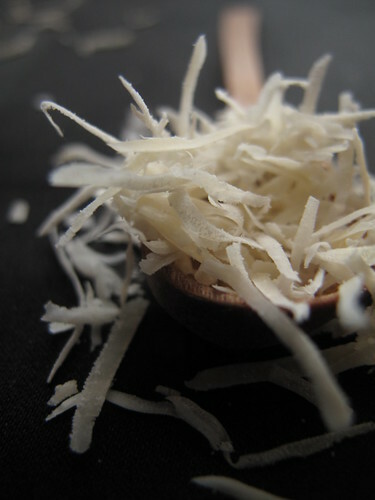 For this Daring Cooks challenge, we had to make our own stock and risotto base, which I did. I followed the detailed instructions given by Eleanor and Jess. 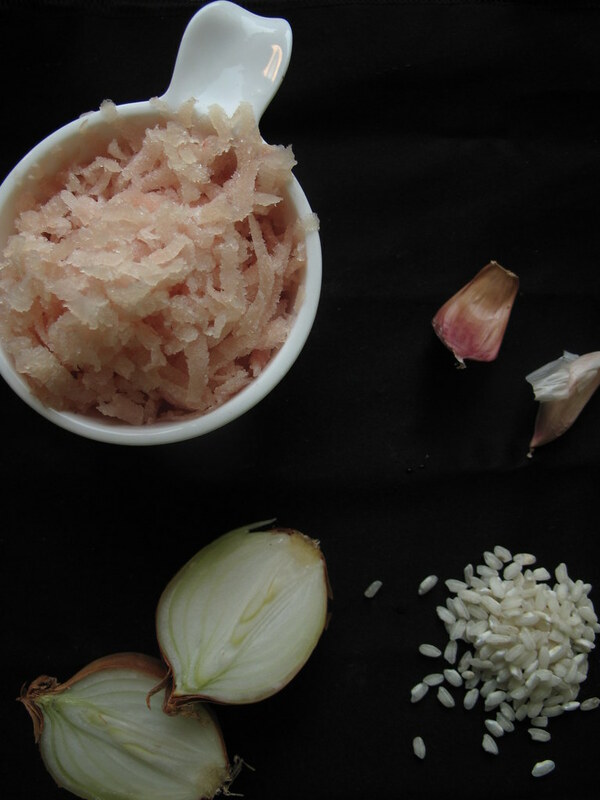 My Top Tip for making superb risotto is to use hot stock and to keep it hot and simmering while making the risotto! It isn’t really a secret though! 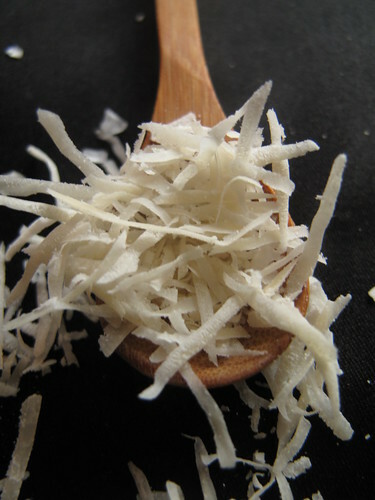 To one portion, I added some grated parmesan cheese and butter and that was it. 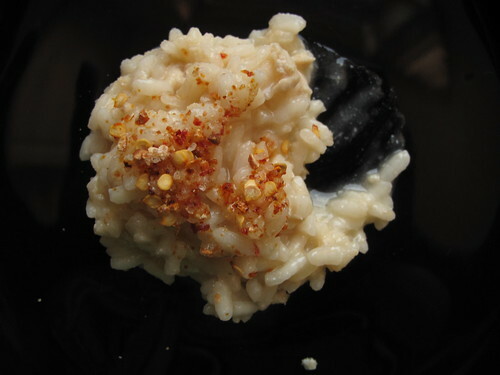 This ‘true’ risotto was served with some tangerine chilli salt and was very much enjoyed by me. I made up some ‘fake’ risotto for Mr and he didn’t enjoy it as much as the pork and cider one. He said the taste of the wine was a bit too strong. He didn’t fault the creaminess at all…… Fake risotto was made up to Step #9. 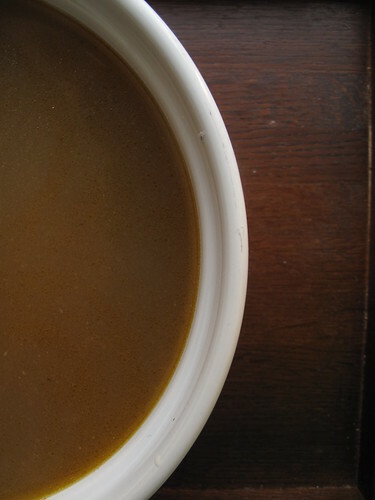 Left for a while and then refreshed with some hot stock and finished off with parmesan and butter. 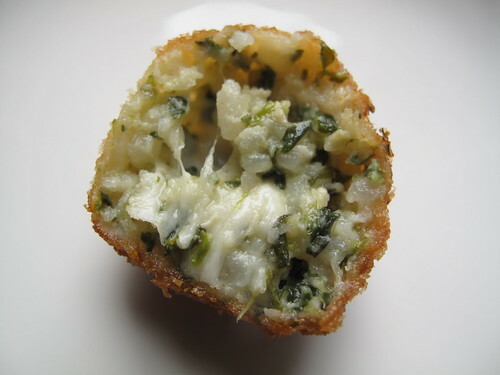 Some went into storage and this weekend, I set about making spinach arancini. For St Patrick’s day. Thanks Aoife for getting me to go green, albeit a little. 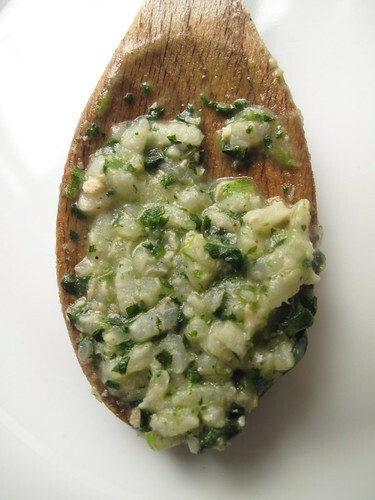 To about a cup of left-over risotto, I added 1/2 a cup of spinach cubes and heated that up till the spinach was melted. 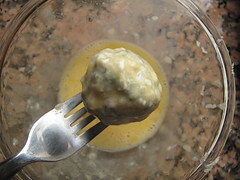 I seasoned it with salt and pepper and when it was cool, stirred in a lightly beaten egg. I set up a conveyor belt of flour, egg (with 1 tablespoon of milk, lightly beaten) and panko (Japanese-style breadcrumbs) in small deep bowls. To one side, were cubes of mozzarella and some leftover meatballs. I had them in small pieces. 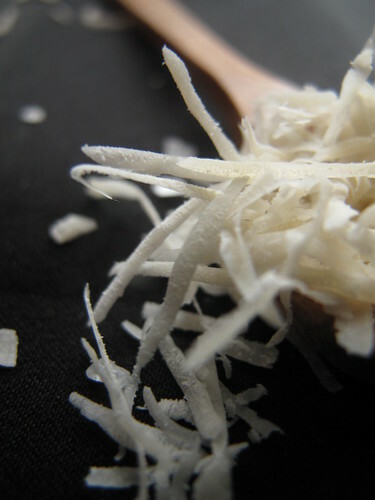 What follows are some great tips for those who hate loosing half their breadcrumbs to sticky fingers when dipping, flouring and crumbing stuff, like me. 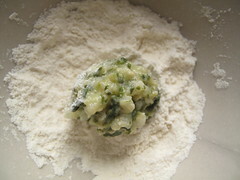 Using a tablespoon, scoop some risotto mix (I’d rather not a whole spoonful cause that would make rather large balls, but if you’re having a contest or something….you could go ahead :-)!) 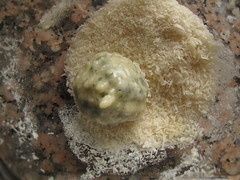 and put it in the flour.At this stage, you can put a mozzarella cube/piece of meat in the centre of the ball. 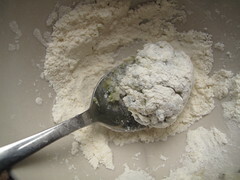 Then holding and turning the bowl round, roll the rice mix in the flour. 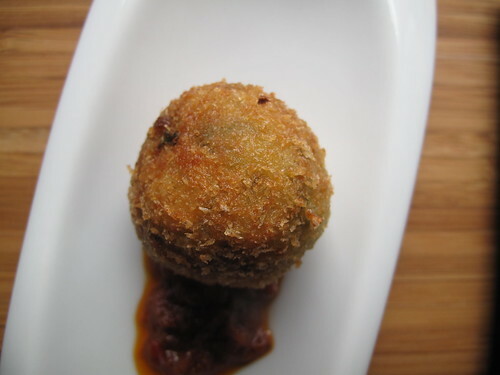 Using a spoon, dump it into the egg bowl and use a fork to gently roll around before putting into the panko. Roll that bowl around too and finally remove, with a fork and set on a plate. One thing I discovered doing it this was was that my ingredients went a lot further than normal and the coatings were more evenly distributed than otherwise. When you’re all done, set the plate in the fridge and let it rest for half an hour or longer. 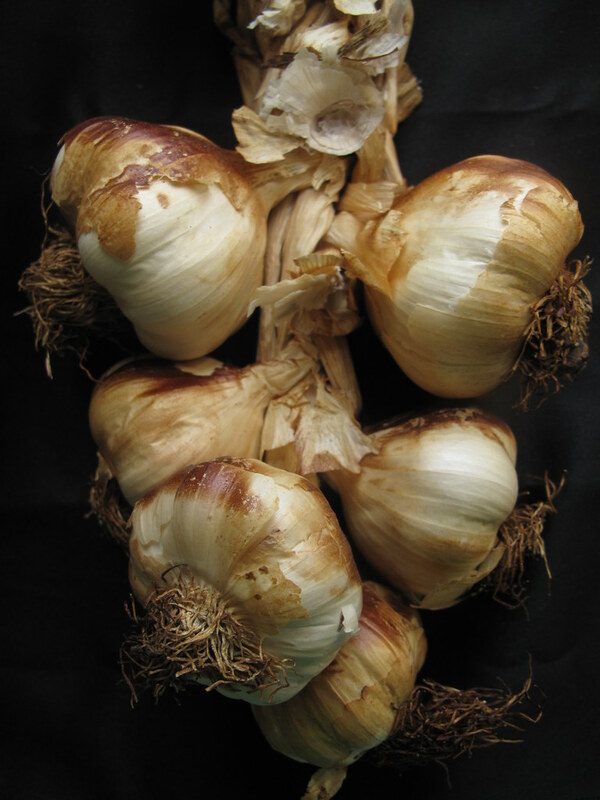 Then deep-fry or oven bake (which I haven’t tried yet) till golden all round. 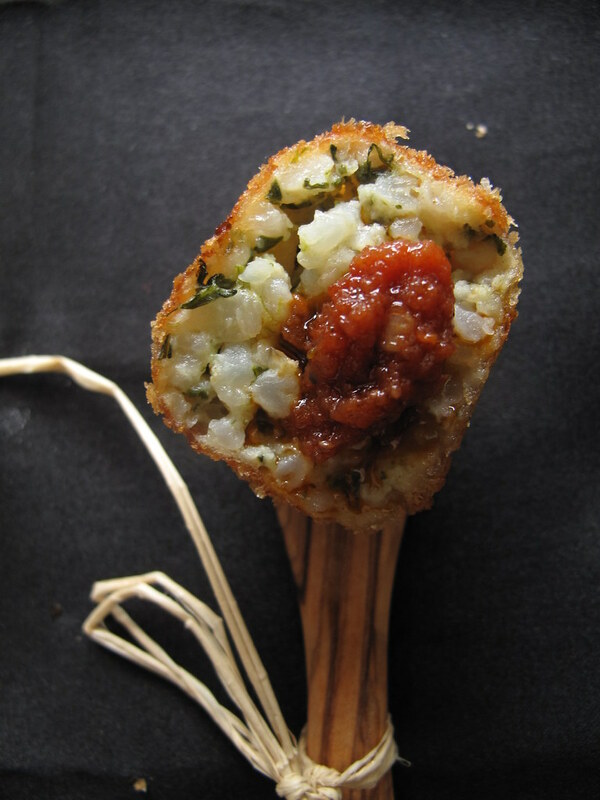 I served mine with a spicy tomato sauce made from passata, garlic, cumin and coriander seeds. We enjoyed it. Even husband who was reluctant to have any quaffed a few :-). The ones with cheese were the yummiest! 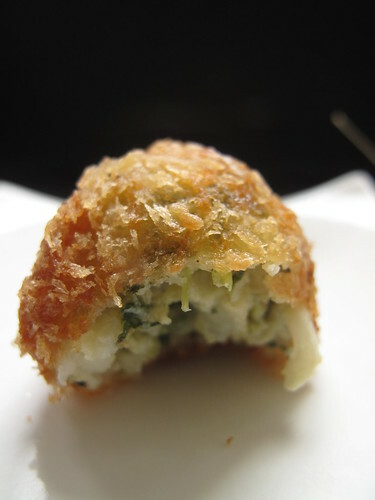 The rice forms a strange crust around the mozzarella – it becomes one with the crumbed exterior. 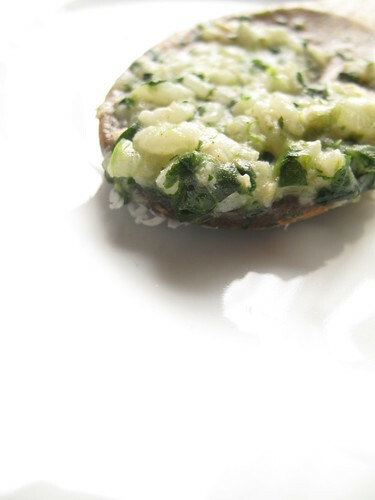 The cheese melts and forms strings and the spinach gives it a light almost herby-but-not-quite- flavour! 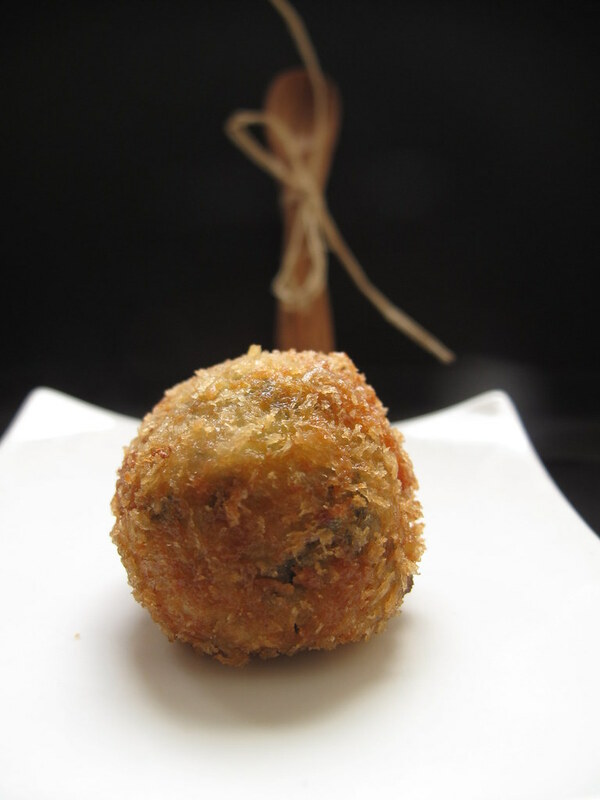 I just feel sated you know, finally I’ve made them.